I understand the 4 rows that form the cable pattern and decrease but I’m lost on the following directions. Please explain this in easier terms. ...Keeping cable pattern and decreases correct as now set, dec 1 st at each end of next 11:7:15:19 ((I’m doing 7)) rows, then on 10:0::0:0 foll 4th row, then on foll 3338:38:37:38 alt rows, ending with WS facing for next row. 4747:49:49:51 sts. I will be ending with 49 stitches. Any assistance is so appreciated. 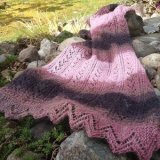 Pattern is Arabian by Lisa Richardson. Thank you SO much. As soon as I read your answer it made sense to me. I think I was making it more difficult than I needed to. I really appreciate you taking the time. Thank you. You're welcome. I think the problem is the pattern not you. I don't understand why the pattern is written that way. It is very confusing. I find it very difficult to understand. Thanks for sending in the question and visiting. I'm sorry for being a little slow to answer this. It has been a very busy week. I'll try my best to explain your question. Here we go. 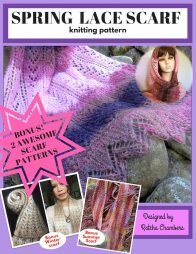 "...Keeping cable pattern and decreases correct as now set, dec 1 st at each end of next 1[1:7:15:19] ((I’m doing 7)) rows, then on 1[0:0::0:0] foll 4th row, then on foll 33[38:38:37:38] alt rows, ending with WS facing for next row. 47[47:49:49:51] sts." Dec 1 st at each end of every row for 7 times. Then dec on each end of every other rows for 38 times. Ending with a wrong side facing. Total st decreases will be 14 + 76 = 90 sts. This should leave you with 49 sts. (you started with 139 sts). I skipped the part where it says dec on foll 4th row because you have to do it "0" time. I hope I explain it clearly. Have fun knitting!